Automatic Music Transcription can be seen as a mathematical analysis of an audio recording which is usually an MP3 or WAV format and the conversion into musical notation which usually comes in a MIDI format. This involves an incredibly complex process performed by AI. There are lots of programs out there that automatically transcribe music, and we chose five of the best to show you’re their main features and to make your choice much more comfortable. The Transcribe! 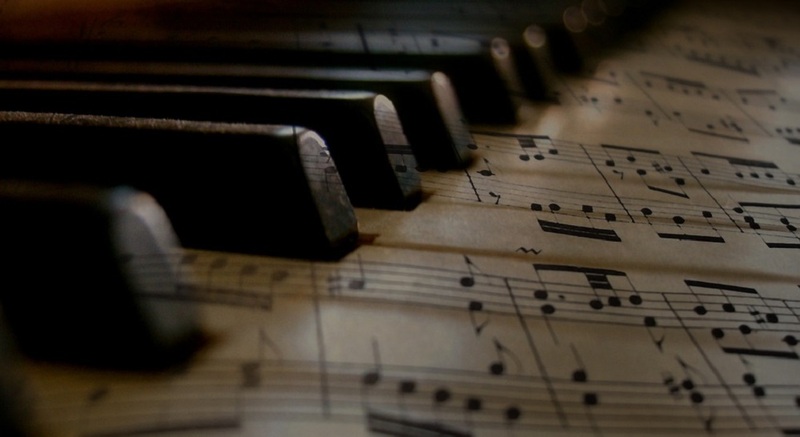 software helps users transcribe recorded music. This is an assistant for people who want to work out a piece of music from a recording to play it themselves or to write it out. This program will not do the transcription for the user, but it is a specialized player program that is enhanced for transcription. This program can also be used for play-along practice. Transcribe! can change the pitch and the speed instantly and you will be able to store and recall any number of named loops. You will be able to practice in all keys, and you can also speed up and slow down. 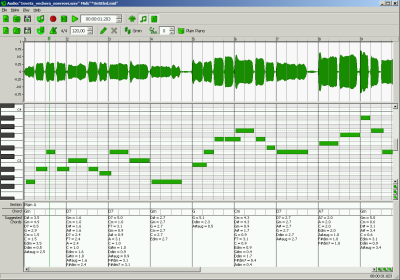 This program is also used for speech transcription. If you are working from a video file, this program can display the video as well. Transcribe! does not work with MIDI files but it deals with audio sample data files. There is some advice about the play-along practice is the software’s help section, and you should check that out as well. Even if the program plays and records audio files, this does not mean that it’s an audio editor. You can check out more data and functionalities included in Transcribe! on the software’s official website. 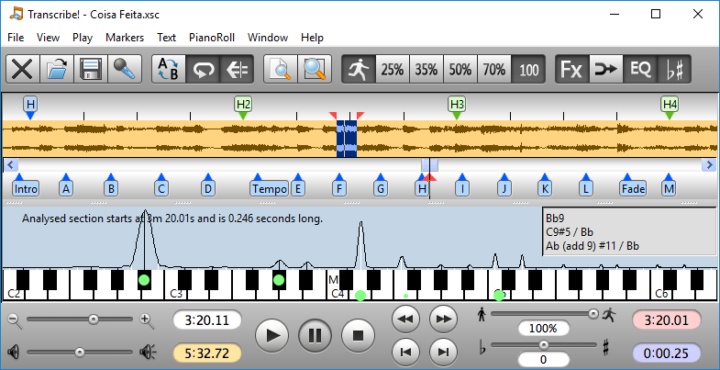 AudioScore Ultimate is the full-featured version of the software known as AudioScore Lite that is included in Sibelius. 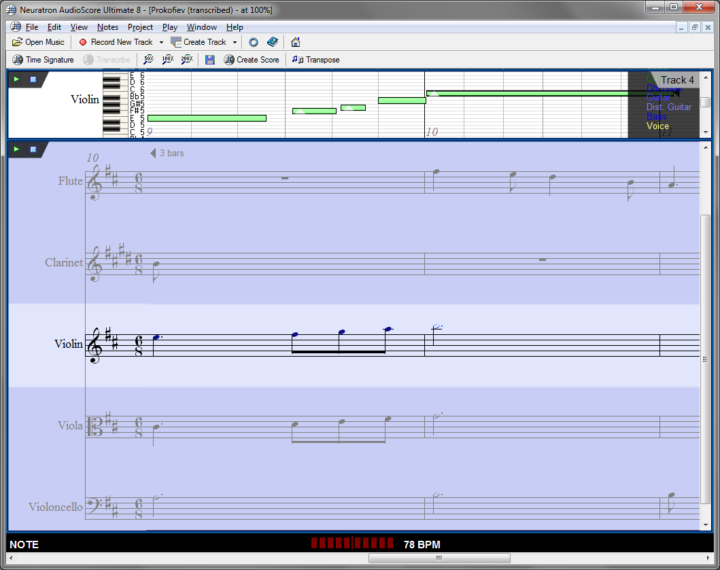 Using this software, you will be able to turn recorded audio, live mic performance or a MIDI into transcribed notation. The software’s audio recognition engine has been completely re-engineered in order to provide increased music detail and precision. You will get improved recognition of multiple overlapping notes. You will also be able to minimize the interference that is caused by percussion and drum sounds. The tool allows you to experience superior pitch recognition and note separation. The software can automatically detect all instrumentation and them it creates a score with staves labeled for each part. You will be able to open a CD track or an MP3 file and transcribe it to a score. AudioScore Ultimate used the most advanced technology that is available these days in order to convert up to 16 instruments or notes at once into multiple staves. 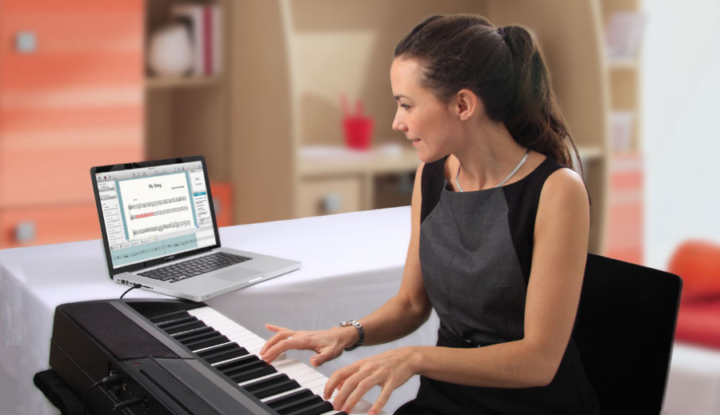 With AudioScore Ultimate, you will be able to create musical scores by playing or singing into your computer using only a microphone. You don’t have to own any musical knowledge to be able to get the best out of this program. You can check out more of its amazing features and get AudioScore Ultimate from its official website. Akoff Music Composer is one of the best tools for transcribing music automatically. This program uses the complicated process of automatic music transcription. To create a MIDI sequence for a melody that is recorded in audio format, a musician will have to determine the velocity, the pitch, and duration of each note that is played. He has to record those parameters into a sequence of MIDI events. It is important to know that you will not get the best results if you try to recognize more instruments playing at the same time especially if there are drums as well. You have to manually choose the appropriated tempo and the bar length in beats before you decided to click the Transcribe button. After the software transcribes the music, it will analyze the harmonical structure of the melody’s line, and it will make the chord progression. Listen to the MIDI melody and correct the wrong notes before clicking on Find Chords. Akoff Music Composer has been in the making for more than ten years, and the software has thousands of happy users. You can check out more of its features and get it from the official website. This is a music notation software for both beginners and more advanced users. The program claims that it’s a sort of Google Translate but for music. ScoreCloud is able to turn your songs into sheet music instantly, and everything is done effortlessly. You will get an instant score from Audio or MIDI. You can arrange and edit your score as well. You also get the opportunity to print, export and share your work. This music notation software is perfect for students, musicians, teachers, bands, and choirs and it’s also ideal for arrangers and composers. Using this program, you will be able to record your ideas wherever you are. Your songs are synced over the internet, and you will be able to pick them up anytime and turn your tune into a masterpiece. ScoreCloud notation software is effortless to use no matter the device that you are using. You will be able to share songs. Manage lists and also collaborate on arrangements with your band, class and choir. The software can automatically store your songs online so that when you edit your score, your changes will instantly sync to all your devices. You can take a look at the official website of ScoreCloud to learn more about this cool software and to try it out for yourself just to see how it works. This is a software that automatically creates sheet music from audio including WAV, MP3 and more. The program uses a neural network that is trained on millions of data samples in order to be able to obtain a high level of accuracy and precision. The software produces the sheet music in a MuusicXML format, and you will be able to view and edit it with any standard music software. 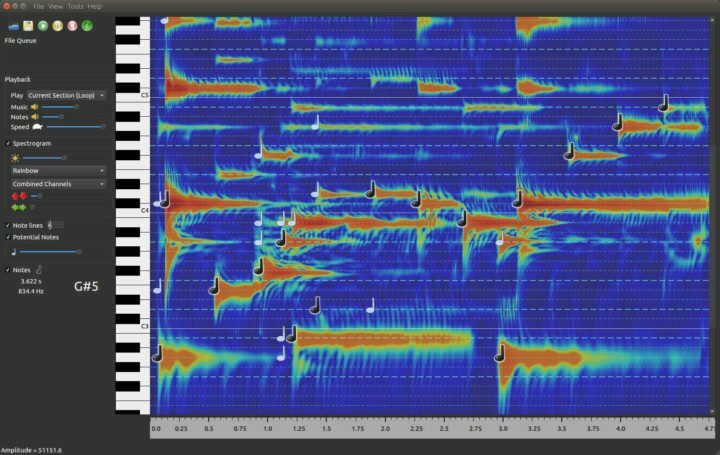 There are a few features that are important for analyzing music. You will be able to view a frequency/time plot, play on a virtual keyboard, slow the tempo, and also save the sheet music in a different key. The notes from all instruments will get combined into one single part. It will take a few minutes to process a song. The staffs option will allow the user to move all notes to the treble or bass clef without having to change their pitch. The pitch adjust options will shift the pitch for all the notes up or down by a fixed number or octaves and semitones. You can check out more functionalities that are implemented into this software on the AnthemScore official website. These are five of the best programs for transcribing music automatically, and we recommend that you head over to their official websites in order to check out their complete set of features before you decide which one is the best choice for your needs.